2. Pack the form together with the label(s). To exchange a broken label, at least 60% of the label should be handed in. The quota percentage on CC Container shelves for the 2018 Repair Quota Year (1 March 2018 – 28 Februari 2019) is 40%. The quota percentage on CC Container shelves for the 2019 Repair Quota Year (1 March 2019 – 29 Februari 2020) is 20%. CC Containers that are a legitimate part of the CC Pool are marked with a CC metal plate and a CC TAG5 on the base. There are different types of metal plates in circulation, always with a CC mark. 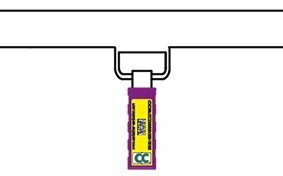 CC Halfcontainers that are a legitimate part of the CC Pool are marked with a purple label on the base.